Call us today at 512-407-2623 for any of your pool building needs in Round Rock, TX. Reliant Pools is a Central Texas pool company that specializes in the unique needs of North Austin and Round Rock, making us your Round Rock pool builder. Our goal is to go above and beyond our customers’ needs and to be the best quality Round Rock swimming pool builder. When selecting a swimming pool builder in Round Rock you want to be sure that the pool company will spend the necessary amount of time with you, providing proper attention, and sending experienced personnel, along with top quality equipment to ensure the quality job our customers have come to expect. We have over 20 years of experience as a Round Rock swimming pool builder and that’s why we continue to be the most trusted of Round Rock pool builders. We are committed to customer service in Round Rock. The biggest key to our successful pool building reputation in Texas is our staff. 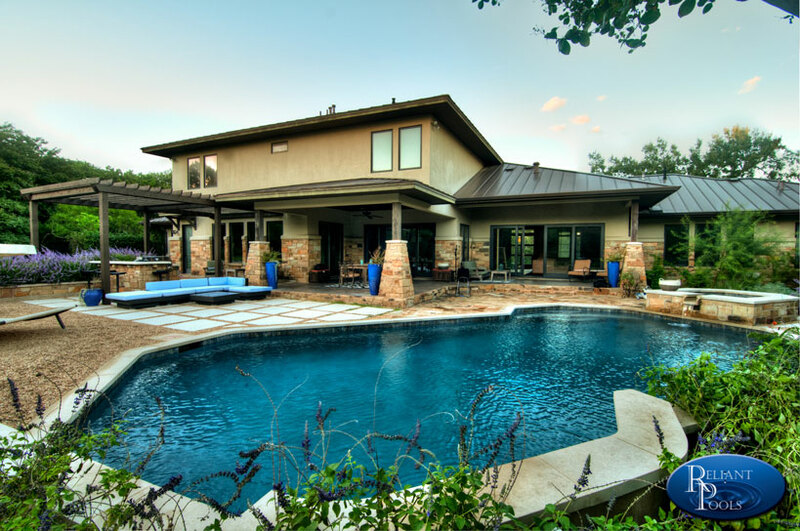 They are knowledgeable, well trained and very experienced as Central Texas swimming pool builders. From HOA approvals and permitting, to completion, our sales and service people will be with you every step of the way. There are numerous challenges that can occur when building a pool. Examples that we are more than comfortable dealing with for our clients include drainage, land slope, soil plasticity, hard rock excavations, poor access, city permitting, and the list goes on. The good news is at Reliant Pools we are well versed in all of these challenges and well prepared for any new ones that come our way. If you live in or around Round Rock Texas, please give us a call today and let us know how we can make your backyard a dream come true. To schedule a free estimate call us at 512-407-2623 or email us to schedule a time. We will take the time to come to your home in person so we can visualize that dream with you to give you a total backyard design that will make you see why we are the premier Round Rock pool builder.